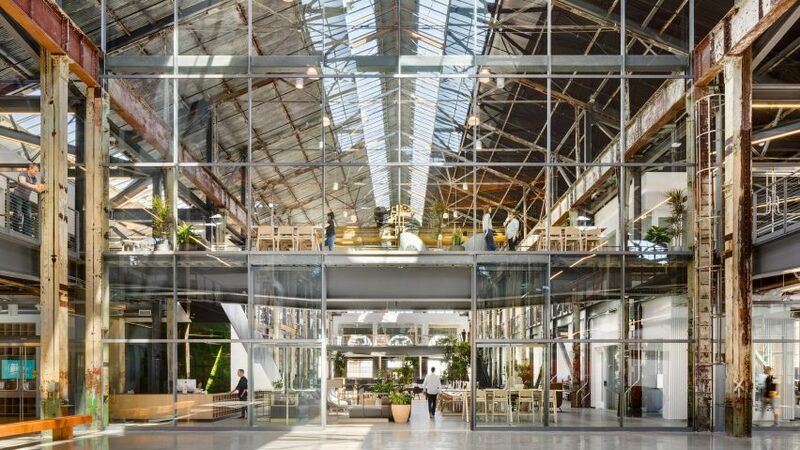 This huge industrial building in San Francisco now functions as office space for an HR software company, where employees are encouraged to take off their shoes. 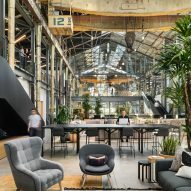 The historic structure, which once served as a machine shop for military destroyers and submarines, has been transformed into the headquarters for Gusto. The company provides a cloud-based payroll, benefits, and HR platform, which has grown rapidly to serve over 60,000 businesses. This expansion resulted in the need for more workspace, which Gusto found at the old shipyard on San Francisco's eastern waterfront. The area was already undergoing major revitalisation, so the opportunity to move into part of one of its largest buildings seemed too good to pass up. Berkeley-based Marcy Wong Donn Logan Architects oversaw the adaptive reuse of Pier 70's dilapidated structures into a usable spaces, while complying with heritage listing requirements. 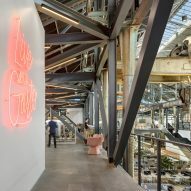 At Building 113 – where Gusto is based – this led the firm to retain, expose and highlight the enormous steel columns and beams, while making a feature of the machinery that used to hoist ship parts from one end of the building to the other. Along the centre, the full height of the space was kept open up to the metal truss roof. This area is treated like a massive lounge, with sofas and desk areas for employees to use for casual working and informal meetings. San Francisco's art-deco McClintock Building transformed into "maker spaces"
"The building was reborn as a larger-than-life living room where Gusties and their guests go shoeless for an unprecedented workplace experience," said a project description from architecture firm Gensler, which was responsible for outfitting the space with furniture, fixtures and equipment (FF&E). A secondary structural frame was tucked behind the original supports to create mezzanine levels on either side. In opposite corners, two minimal black staircases provide access to the upper floors and create a strong contrast to the industrial finishes. Offices spaces and meeting rooms are situated below, leaving the top level open for more lounge spaces and kitchen areas. These take advantage of the building's large arch-shaped windows and exposed brickwork. At the front entrance, glass panels stretch floor to ceiling to show off the scale of the structure. 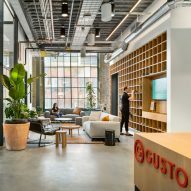 "By building [Gusto] a unique and highly-tailored work environment, we hope to support their growth and innovative ideas," Gensler said. Similar regeneration of shipbuilding facilities into workspace has occurred at the Brooklyn Navy Yard, where Marco Sea converted an equally impressive building into the New Lab for tech entrepreneurs.